A post on facebook by Christine Croncau brought to my attention that, in the US, 3.5 million people tuned in to hear Dr Oz do an about-turn on the role of cholesterol in heart disease (compared to the effect of processed carbohydrates). It was startling. “Dr Oz, a well respected cardiologist, acknowledges the cholesterol myth…” Hang on, what was that?? Dr Oz is a well-respected medical doctor? That in itself was a revelation to me. The same doctor who showcased raspberry ketones as one of the five top fat-burners you could try? Anyway, while I wouldn’t always hang my hat on what Dr Oz promotes, he definitely has some influence in the public space. And the clip is definitely worth a watch if you have 10 minutes as Dr Oz interviews Dr David Perlmutter, an experienced neurologist in the US and author of the Grain Brain – a book that explains his findings (through his clinic) and those of numerous studies of the effect that CHO can have on brain function and subsequent neurological disorders. The controversial part of that concept isn’t that sugar increases our risk of dementia – in fact alzheimers has been more recently termed ‘type 3 diabetes’ to reflect this relationship. What was more challenging was the idea that all carbohydrate has the potential to increase risk of dementia, and that Dr Perlmutter was advocating for an almost carbohydrate-free diet. Unsurprisingly when his book came out there was an immediate reaction from some of the influential people in the food industry space. This article from the Food Navigator is one example. To shamelessly cherry pick a quote from those opposed to his recommendations: “I mean, he is advocating people eat salmon and avocado for breakfast, is that realistic?” Hmm… obviously the Whole Grain Council took exception to Dr Perlmutter’s recommendations, but strangely seemed more offended that he wasn’t advocating totally grain free – recommending the gluten-free grains of buckwheat, quinoa, sorgum, and rice (in moderation). They assert there is no scientific evidence to back up his claims that gluten affects the brain. Irrespective of numerous articles such as this one I found just by doing a cursory search on Google Scholar, I wonder at what point his experience in the field serves as evidence. Closer to home, ABC’s Catalyst show, a science journalism show on primetime TV show released the first in two part series that investigates the saturated fat, cholesterol and heart disease myth which is a good watch, and Grant was the focus of a Sunday Star Time’s piece on LCHF this week too. While I love to see this information hit mainstream media, I often think it’s a double-edged sword. If ever our dietary guidelines did change to reflect an update of knowledge we would have to rely on avenues such as mainstream media to get the message across. And that message gets lost in translation, skewing people’s perceptions of what is being advocated for. Frequently. Take the first sentence on the BBC Network page: “the risk from saturated fat in foods such as butter, cakes and fatty meat is overstated.” Let’s be clear: the risk from saturated fat in processed, refined, sugary cakes is not overstated. If journalists reporting on the story aren’t able to get the facts straight, what hope is there for the general public reading it? Nutrition is confusing; food is not. Perhaps if we focused more on whole foods and less on nutrients the message might be clearer, and might seem less ‘fringe.’ Food for thought. I love a good cooking show. Nutritionists often get into the field because of their love of good food, and we are similar to chefs in that respect. Chefs are food advocates and aim to give pleasure through food. To my mind (as a nutritionist) the enjoyment of food comes from nourishment – from flavours, textures, nutrients and appropriate portion sizes. Most chefs share similar sentiments. In addition, food goes through fads, really – a lot like diets. And, like many nutritionists and dietitians, some notably high profile chefs seem to be moving away from the gastronomical, fantastical approach to food (the extreme version being Heston Blunderthal) to more of a back-to-basics approach. The focus on a few fresh ingredients with little superfluous additives (unless, of course, they are sponsored by the food industry). And some have always been that way inclined. My massage therapist had recently been in Hamilton to attend an evening which gives the opportunity to learn cooking tips and dishes from (amongst other chef’s) Ray McVinnie – columnist in Sunday Start Times, AUT lecturer in gastronomy and a judge on NZ Masterchef. I’m a big fan of Ray’s – he provides wholesome, realistic recipes and creates meals from traditional kiwi dishes to contemporary Asian cuisine. He advocates real food and no additives/preservatives (other than that in wine) and Ray appears to glow ‘health’ – and it’s not just his slim build. While it could just be the lighting, there are other high profile chefs who just do not look healthy, and their food fare is less appealing to me than what is made from someone who seems to exude health. Along with a lot of great cooking and food tips that Ray shared, he also shared his views on children and health and the differences he has seen in the prevalence of children who are overweight in the countries he has spent time. Now these aren’t necessarily based on academic papers or country-specific statistics of child obesity rates, but his perception of spending time immersed in the culture and the food environment of those countries – the experience that isn’t often captured by a scientific trial or population survey. I found it interesting to hear what he thought, and though this may read like a New Weekly magazine article (“a close source revealed…”) wanted to relay them here, as food for thought. Meals eaten outside of home. This isn’t necessarily country specific (and certainly there are regions in Europe where lifestyle dictates people eat more of their meals out than in, but he noted that children were less likely to be overweight in regions where parent’s cooked from scratch. In the last child nutrition survey found that 7 out of 10 children ate fast food in the last week, and 1 in 7 ate at least two meals out. These meals are more often that not higher in processed, refined carbohydrates, cooked in vegetable oils, lower in vegetables and overall nutrients and higher in sugar. All of which contribute to obesity and disease processes in the body. Interestingly, recent research in the US shows that those of lower socioeconomic status (who are more likely to be overweight) tend to cook more in the home than those with a higher household income. This may be viewed as ‘bucking the statistical trend’ but it’s more likely the ingredients used in home cooking (and the level of cooking skill) are not conducive to healthy eating. It would be interesting to see what the state of ‘home cooking’ is like in New Zealand. A recommendation from the US study was to increase cooking skills, and focus on convenient whole foods requiring minimal preparation. Child-specific meals: Another aspect of eating in the home that Ray attributes to poor eating habits in children is the notion of ‘separate kid meals’ where the children eat a meal at 5.30 or 6, then they are put to bed and the adults eat a different dinner later in the evening. Other than when Dad worked late, we ate our meals together growing up and my parents viewed meal time as ‘family time,’ Sharing meals as a family is important in the overall development of a child, and is an opportunity to not only learn about table manners, but for children to learn how to interact with adults. In Europe, children are given a snack when they get home from school, then eat with their parents later in the evening when dinner is ready. This is because, traditionally, the evening meal is later than the evening meal here. Logistically speaking it may not be practical for parents and children to eat together as they once did, but along with the child-specific meal times, children are often fed different foods. Allergies aside, is there any reason the food choice should be different? The concept of ‘kid-friendly’ meals and food choices pervades our food environment more now than ever before. I can’t remember our foods being different from our parents when we were growing up. With five children to contend with, we were basically served food and made to sit there until it was eaten. Many people I see in the clinic talk about having to serve two different meals in the evening: one for the children and a separate ‘adult’ meal. This is becoming a lot more prevalent than it was a few years ago. And it’s obviously not just happening in the home – ‘child-specific’ menus are readily available in not only fast-food restaurants, but your standard cafe – where there is a notion that children require different food choices to adults. Why is it okay to serve children food devoid of nutrients for $8 and not just smaller portions of the same food? Baffling. I had lunch today with my BFF from high school Rebecca, and her and Darren had brought along chicken, cucumber, a banana muffin (grain-free) and ordered a side of mushrooms on the side of their meal. Lots of parents do this, and it would make sense to me that cafes would offer foods like this as part of a kid’s menu. Makes more sense than saveloys, chicken nuggets and hot chips. 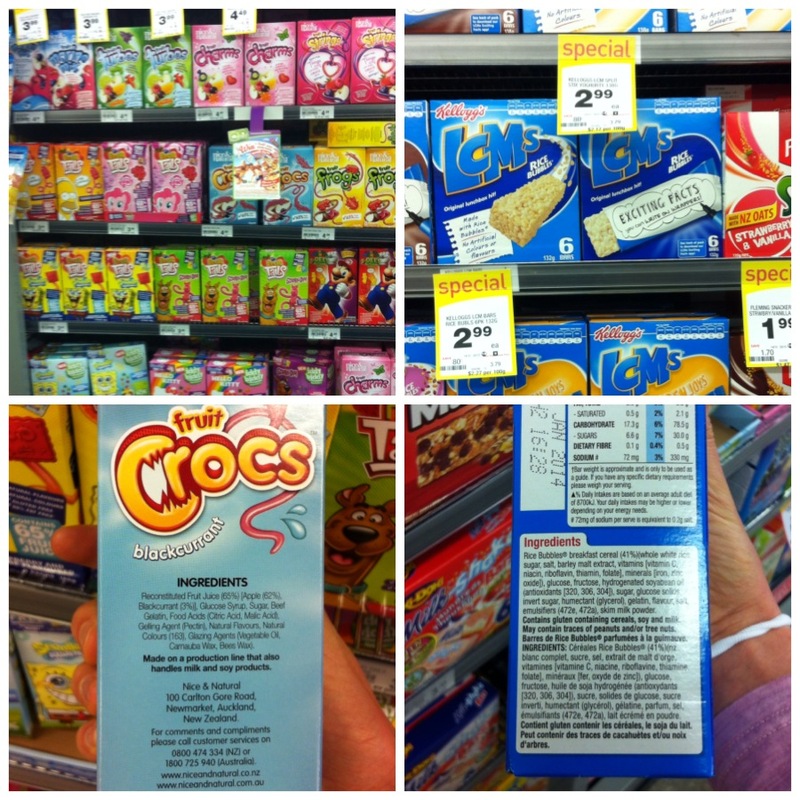 Have some hydrolysed vegetable oil with that fruit crocodile. Cheers. Children-specific foods. Cereal bars. ‘fruit leather’ as opposed to fruit. Fruit squirts. Snack bars. Parents are often wooed by the idea that these foods will increase the nutrient density of an otherwise nutrient-poor breakfast or lunch box. The ‘Ironman’ Nutrigrain or the ‘as much fibre as two weetbix and milk’ Up and Go. The goal shouldn’t be to look for the packaged food that contains the most amount of added vitamins. It should be to look for the food that has the least amount of associated plastic. I know, easy for me to say, right? I often wonder when it’s okay to have an opinion given that I don’t have children. But then, I’m not male and confidently advise men on ways to improve their diets. It was great to hear people like Ray McVinnie sharing his views in health, given his career is all about feeding and nourishing people. These things go hand in hand and (perhaps it’s ‘pollyanna’ of me to assume this) this must in some way influence the foods he uses and the dishes he creates. On that note of creating a dish, the summer weather has inspired me to make a cauli-tabbouli salad to go along with dinner, and I’ve popped the recipe I used on the recipe section of the blog. How has my advice changed? I posted a link on Facebook yesterday, an article outlining the findings of research by Paul Laursen from High Performance Sport New Zealand on the impact of dehydration on performance. The research found that when athletes were blinded to their hydration status (believing that they had been rehydrated through an IV after being dehydrated by 0, 2 or 3%) there was no difference in performance. A friend, responded: ‘I call BS on this article’ and that the next article published will support the opposite hypothesis. The sentiment of what CK said holds true (though I don’t agree with his first call). Nutrition is constantly changing – and it’s up to us to keep up with the research. Interestingly this morning on our run Grant started a conversation with ‘Now Mikki, don’t take this the wrong way…’ and preceded to tell me that someone he was talking to had said he’d never trust what I told him when it came to nutrition, as it would be completely different to what I told his fiancé a year ago. While I got the inevitable feeling of dread when someone tells you not to take something the wrong way, I breathed a sigh of relief when Grant relayed the conversation. Is that all?? Whatever. I’d much rather that than be known as stagnant in my dietary advice. Saturated fat: Where once I shied away from saturated fat (for example), now it’s largely acknowledged that the initial evidence suggesting an association between saturated fat and heart disease was inflated, and subsequent scientific trials testing the hypothesis finding no such relationship. Butter (as a natural fat) is a much better alternative for most people than margarine, which is high in omega 6 fats that are pro-inflammatory in large amounts in the diet. Eggs, as another example, are a great source of the B vitamins, contains vitamins D and E and monounsaturated fat. Containing all of the essential amino acids, they are a super food, IMHO. There is, however, still a stigma around the amount of egg yolks we can include in the diet due to their saturated fat content. At the public health level, the recommendation of lower saturated fat in the context of a typical Western diet makes sense, given that it’s the combination of fat and carbohydrate in refined foods that contributes to fat gain, inflammation and subsequent health problems. However if someone is talking to me about their diet, then they are not going to be following a standard Westernised diet where it would be of concern. Salt: It’s not sodium in the diet that’s the issue per se – it’s the overall nutrient content and particularly the ratio of sodium to potassium (a nutrient found in fruit and vegetables) that requires attention. Of course, if you’re someone who eats substantial amounts of pre-packaged foods and don’t have a good vegetable intake, you are better to reduce overall sodium. And as what I just described is pretty much the diet of many people in the general population, it makes sense that the recommendations of low sodium in the public health sphere are in place. However, if you move to a whole food diet then focusing on reducing salt is not longer an issue – most of the sodium in your diet has been removed with the removal of pre-packaged foods, and the potassium content has been increased exponentially. Artificial sweeteners: do these cause cancer? Who knows? And who knows if we WILL know in our lifetime – however, if the fact that they are made in a lab doesn’t put you off using them, their ability to trigger signals in the brain that sets off cravings for sweet foods, and potentially have the same metabolic effect in the body as sugar might. It’s much better to remove completely and adjust to the flavour of naturally sweet food that was previously overwhelmed by too much sugar or sweet tasting food in the diet. Cereals, breads, crackers etc: There are far better choices for carbohydrate in the diet than foods that have added gluten to increase protein intake (i.e. Special K) and that leave you hungry about a second after you eat them. The same goes for bread or wraps that can leave you feeling sleepy and lacking in energy soon after eating them. – a function not only of gluten but of other proteins in grains that are being recognised as causing a similar immune reaction as gluten. In addition, while there are few people who are test diagnosed with coelics disease (an allergic reaction to gluten), there are many people who may have non-colieac gluten sensitivity (NCGS) and therefore feel better once they have removed grains from their diet. Note: I’m not recommending switching out gluten-containing products for gluten-free products – but whole food sources of carbohydrate. So rather than my recommendations being turned on their head in the space of the year, I feel they’ve been refined to reflect the increase in my knowledge around food and health. Instead of not trusting me based on this refinement, I hope instead that people feel confident my advice shifts in line with the changing state of the evidence, and is not stalled by long-held beliefs. And on another note entirely, I tried a cronut. Despite that I felt they were largely overrated, I knew people would want a paleo alternative. So I did my best to hunt one down. Enjoy. I love sharing stories of friends and clients who have adopted a healthier approach to eating and have seen some real benefits. Jane McClurg, a massage therapist at Balance Massage Clinic (where I consult from) is a good friend of mine who was happy to share her (and her husband’s) story. I always considered myself a foodie with a tendency for healthy food, but perhaps with a little weakness for sweet baked goods, but who doesn’t right? My diet would typically include homemade muesli with low fat yoghurt for breakfast, a trim latte, a wholegrain sandwich or roll with homemade soup for lunch and dinner could be anything from Thai laksa with brown rice, salad and steak, to casserole with mashed potatoes or homemade burgers. I’ve also never actually been on a “diet”; I’ve never needed to. At 5’8’’ (171cm) tall and about 63kg, I have been told I’m one of those annoying people who can eat whatever she likes and doesn’t put on weight….so why did I decide to try this “new” whole food thing? I am a massage therapist but this year is my first year studying to be a naturopath as well, so my level of consciousness around food has been heightened and I seem to be devouring any information on it that I can (excuse the pun). In particular, I have developed an interest in an all too common occurrence in many of our lives: inflammation. I see it in my clients who’s injuries are slow to heal, and a couple of people close to me being diagnosed with rheumatoid arthritis and Lupus, both auto-immune disorders that have high inflammatory markers. The more I read about the relationship between diet and inflammation, the more I was intrigued with the stories of how making changes to the diet can have such a dramatic affect on improving symptoms in people with these conditions. I’m lucky that Mikki is a client of mine and so when she’s on my massage table we discuss food, swap recipes and of course talk paleo. So I asked myself…further down the track (when I am a qualified naturopath) am I going to prescribe an eating plan such as paleo/primal/whole foods if I haven’t tried it? No. So the challenge was set. Further, a particularly big ‘birthday blowout’ month left me feeling lethargic and (some may say) a little moody, so I sent a desperate email to Mikki asking where to start. She advised me to check out the Whole 30….and the rest (as they say) is history. I bought their book It Starts with Food and couldn’t put it down… July 8th was Day 1 of our 30 days to “go clean”. My husband decided to come along for the ride, so we cleaned out the pantry and fridge of all dairy, grains and sugar and set about making our own beef and chicken stock (how easy when you have a slow cooker!) and prepared a few other essentials. The first week was a bit of a struggle to adjust to how much to eat, especially for hubby who still wanted to train hard at the gym but felt tired and lacking in energy, so ended up only going a few days in the first 2 weeks. The Whole 30 recommends taking it easy while your body adjusts from burning sugar to burning fat (and this can help heal the gut lining too). But by the end of week two we were away…kumara, scrambled eggs and avocado for breakfast, salads with chicken breast and pumpkin for lunch, nuts and seeds for snacks and fruit with nut butter (yum! ), and homemade Rogan Josh curry with cauliflower rice for dinner. Rather than feeling deprived of my usual foods that I couldn’t have, my head was spinning from all the new recipes I wanted to try. Interestingly, by Day 10 hubby had lost what I liked to call the Bloaty Bread Belly and the six pack that was hiding underneath was back! I noticed I wasn’t hungry for morning tea ( I gave up coffee too but hubby changed his latte to black coffee) and my meals were seeing me through to the next meal. The combination of protein, vegetables and good fats were keeping me going (and I have a physical job as a massage therapist), and my craving for sweet things disappeared! Day 30 came and went and we have continued on with our new “life eating plan”…the more nutrient dense foods we eat in each meal are so much more sustaining and satisfying than the zombie* foods we used to occasionally eat. We’ve reintroduced some dairy, a bit of feta or parmesan and yogurt but the good stuff: full fat and organic if we can get it. A few treats here and there but generally we eat the same as what we did on the Whole 30. My mood is much more even and energy levels are back up too…I’m not gonna say that I spring out of bed at 5am and run a half marathon every day but I don’t get the afternoon crashes I used to have. I also have more energy in the evenings for my study (and for cooking!) And hubby? His training is going well and he’s had a lot of questions from people asking what he’s been doing …he’s spreading the whole food word too. 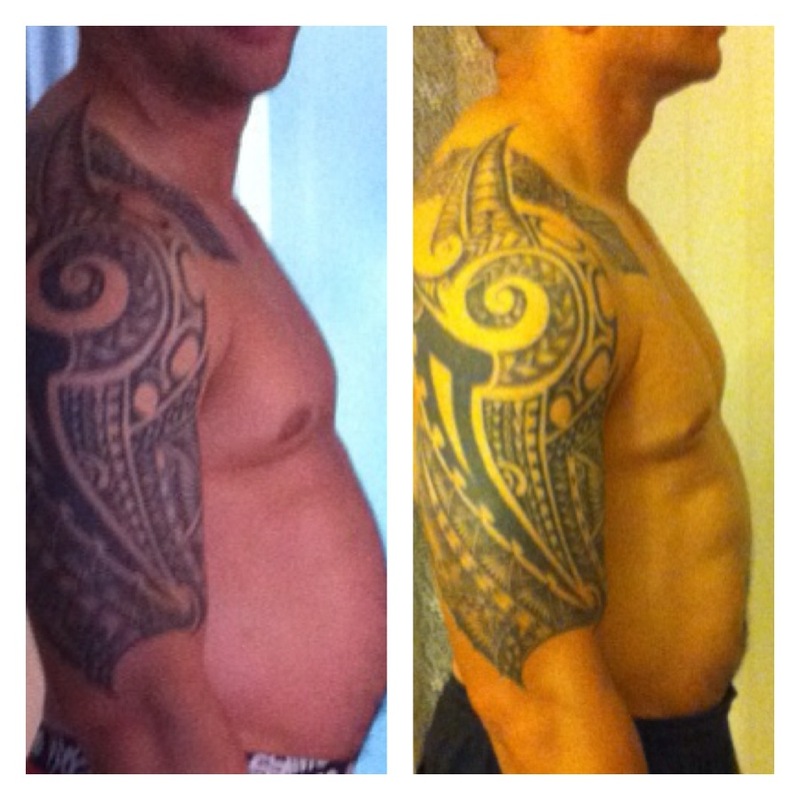 For us it wasn’t about losing a heap of weight, it was about adopting a healthier way to eat, getting the nourishment we need to sustain our energy levels and boost immunity…basically stay healthy. And yes, as a future naturopath I would recommend this style of eating. In fact, I recommend it to everyone now! 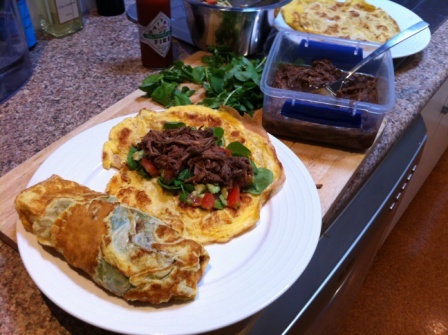 One of our favourite meals is this slow cooked beef recipe (with some small adaptions) with watercress, avocado and tomato salsa, served in egg burrito wraps. Egg burrito wraps: one egg whisked then poured into a hot pan that contains melted clarified butter…swirl around and wait for it to bubble up, flip and cook on the other side. When done flip onto a plate, keep warm in oven while you make more, then load up your meat, salsa and watercress and wrap! Yum! With meals like this, there’s no looking back.